I got this Chalice in a trade from another hobbyist years ago, but don't recall the name. It's a beauty, and I enjoy looked at it especially at night when the actinic XHOs are running. It's orange skinned with yellow mouths, and contrasts with the green chalice behind it. Chalice corals are slow encrusting corals. If you try to frag them, then often break as easily as if you were trying to share a potato chip. Ideally, leave it alone and enjoy what you have is my motto. This is a "Moon favia" that has been growing slowly on the substrate of the Anemone Cube for years. What attracted me to this coral was the baby blue hues with the rich golden centers. All the sparkly dots just add to its beauty. I lost most of this coral at one point, leaving four surviving polyps... which was more than enough to see it regrow into something pretty like it is now. This is a LPS coral. I don't target feed it, it captures what it can during the nightly feedings. The Turbinaria peltata or Cup Coral is a relatively easy coral to keep. It does best under moderate lighting, and can be feed plankton-sized foods if necessary. It will grow in mass, getting wider over time. Watch the leading edges where new polyps form, displaying that new growth. It comes in a couple of colors, such as golden brown or green, as pictured. 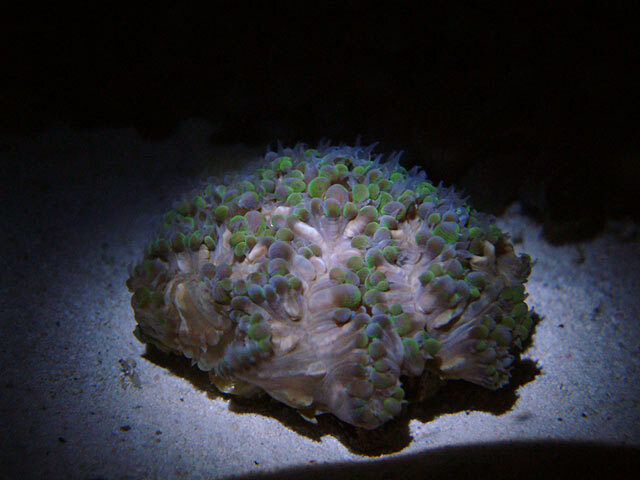 The favia coral nicknamed War Coral is a popular choice. Its name is derived from the way the colors are segmented by barriers, more than likely. Here is a coral many people fall in love with, but it needs some TLC to keep it alive and happy. These grow in ocean caves, typically upside down. I got this Sun Coral - Tubastrea - in a trade with a club member, feeding it nearly daily with mysis shrimp. Because my clownfish seem to think my hand is dangerous and nip at me, I've created a feeder with a turkey baster and a length of flexible tubing to drizzle the thawed food over each polyp. Feedings take about 15 minutes, and I turn off the pumps while doing so. Goniopora is a difficult coral to care for, usually best for more experienced reef keepers. Basically, it needs a nutrient laden environment to thrive, and our tanks are often too pristine. The Red Goniopora is considered the hardier one, compared to the abundance of green ones for sale. They die slowly over time, receding from the skeletal base. Success can only be measured in years of captivity, and few are able to do so. I purchased this one from a reefer that kept it for nine months. This LPS is about 6" long and 4.5" wide and 3" tall. It is a brain coral, called Platygyra pini. It is another coral that filter feeds at night, extending small polyps from the openings to capture planktonic-sized foods. This is a coral from the Bubble family. It has been suggested it might be a Pearl Bubble Coral, but I've not seen one like this before. As you may have considered, it kind of looks like a Ricordea. This one has a mixture of pink and green bubbles. At night, it looks far different. Bubble corals are LPS corals, and need gentle to medium flow, and reef parameters to thrive. Similar to Frogspawn, this LPS coral is nicknamed Octopus Coral or Octospawn. Its needs are the same as any LPS, which includes good lighting, moderate flow, and stable water parameters. It doesn't need to be target fed, but will eat diced meaty foods at night. The nickname is likely due to the abundance of dots, similar to all the sucker cups of an octopus. Octospawn are often lighter or more pale that their Frogspawn counterpart. Posted 12 hours 19 min ago.